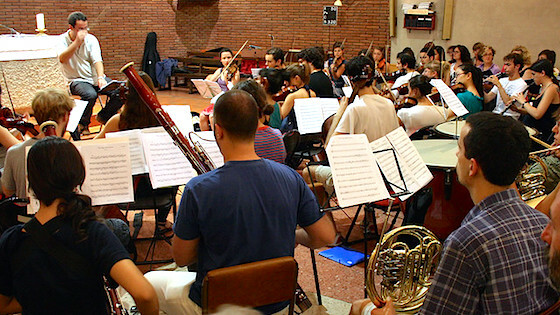 December 4, 2012, 3:25 PM · Whether you’re in an orchestra for the first time or you’re an experienced orchestral performer, you’ll soon notice that there are some unwritten “rules” pertaining to your involvement and behavior during rehearsal. Conductors even have their own style and set of expectations for the musicians under their direction. It’s understandable if you feel a little nervous when performing with a new ensemble for the first time. Too bad no one will hand you a copy of Rehearsal Etiquette for Dummies. So if you’re wondering what to do and how to act in rehearsal, here are a few tips to keep you in the know. 1) Come having thoroughly practiced your music. Nothing is more frustrating to conductors than to waste time rehearsing passages that the orchestra members didn’t practice ahead of time. 2) Before you head to rehearsal, double check that you have your music, instrument, bow, rosin, reeds, and any necessary accessories. Be sure to note whether or not you need to bring your own stand to rehearsal or you’ll be scrambling without one. You might consider keeping a wire stand in your car (like a spare tire) just in case! December 5, 2012 at 04:15 PM · for fingerings, the unspoken rule is usually that the outside player puts theirs above the line & inside player puts them below. December 5, 2012 at 05:10 PM · The "unspoken rule" about fingerings above and below - I've never heard that before (and I've been playing in orchestras for 50 years). What a great tip! December 5, 2012 at 07:50 PM · I'm new to orchestral playing...any insight on proficient page turning for the inside player? I've had to sit next to the concertmaster for a few rehearsals and I felt totally unsure of my timing on page turns - is there a more correct way to do this? For example if there are multiple bars of rest, or a particularly fast passage. I apologize if this is ridiculously obvious! December 5, 2012 at 09:03 PM · Generally if there are a ton of rests I will write (lightly) on the next page how many I have to count. If they're in sections and there are multiple time or key changes I will stay on the page a bit longer and on the next page section accordingly when I write in the info. Laurie has a brilliant clip on youtube about how to turn pages quickly. December 5, 2012 at 11:10 PM · Excellent list! We take a short break midway through rehearsal and when we have different seating assignments for different pieces, you end up with players who can not take their new seat if the previous player left their instrument there. I also think it's very risky to leave your instrument on a chair as it can easily be knocked off or worse. December 6, 2012 at 01:06 AM · Great article! I couldn't agree more with so many of the items! December 6, 2012 at 09:00 AM · Terrific - this is my first year with an orchestra and I've had to learn these first hand. One little extra tip is to pre-tune your violin to an electric tuner (440). You may have to make small adjustments to the oboe but they are that - its embarassing to be the last one tuning! December 6, 2012 at 01:14 PM · If you're going to tune with a tuner before the group, it doesn't hurt to ask the oboe what they're tuning to. It could be something other than 440, especially if there's any kind of keyboard in the group. December 6, 2012 at 02:49 PM · During breaks, *do not* walk through the percussion set up, ever. Go around. December 6, 2012 at 03:05 PM · If you're a section string player, please don't raise your hand to ask the conductor a question. That's a breach of etiquette. Pass your question up to your section leader, who will either answer the question or ask the conductor her(him)self. leave any individuality you have at home. Please, recite Jante's laws before each rehearsal and before going to bed. 1. You're not to think you are anything special. 2. You're not to think you are as good as us. 3. You're not to think you are smarter than us. 4. You're not to convince yourself that you are better than us. 5. You're not to think you know more than us. 6. You're not to think you are more important than us. 7. You're not to think you are good at anything. 8. You're not to laugh at us. 9. You're not to think anyone cares about you. 10. You're not to think you can teach us anything. December 6, 2012 at 06:20 PM · I really like the hint about arrogance! What has to deal Tchaikovsky violin concerto in a Vivaldi musica rehearsal?? December 7, 2012 at 12:41 AM · Great list! December 7, 2012 at 04:21 PM · Wonderful comments! Thank you for the additional contributions. Great stuff.